Today, workers from General Dynamics Information Technology (GDIT), the top federal contractor in the call center industry, joined a panel discussion on Capitol Hill to shine a spotlight on how labor law violations at federal contractors keep workers in poverty. The congressional briefing was hosted by Representatives Ro Khanna of California and Rosa DeLauro of Connecticut. Stella Payton, a customer service representative at the GDIT call center in Hattiesburg, Miss., said that the phone calls she deals with can be a matter of life or death. "I had a consumer enroll during the open enrollment period. She was literally hours away from her window closing and not being able to get healthcare. That could have been life or death for her if I didn't have the knowledge to help her navigate the healthcare system. Because of the low wages, there is high turnover, and consumers suffer when that knowledge walks out the door. Having a voice on the job can help us achieve fair pay and the dignity we deserve." "Some of the folks we provide services for don't have someone to help them. I look at it like if it were my parent or grandparent, I would want someone to give them good service," said Amanda Stewart, who works as an Internal Support Group agent at the GDIT call center in London, Ky. "When we found out that GDIT was cheating us out of our pay, it was disappointing, discouraging, and depressing. And it made us angry. A federal contractor should not be violating federal labor laws." The briefing coincided with the release of a new policy brief by the National Employment Law Project on the continued prevalence of labor law violations by federal contractors including GDIT and XPO Logistics, the disproportionate effects on women workers, and how federal agencies can use existing tools to ensure that their contractors follow the law. "This is just a basic matter of fairness," said Rep. Khanna. "Workers must have the right to form a union, bargain collectively, and get the wages they deserve." "The biggest economic challenge of our time is that people who play by the rules are in jobs that don't pay them enough to live on," said Rep. DeLauro. "It is a struggle. Wages have been stagnant for about 30 years. You all are real heroes, and we want you to know you are not alone in that struggle." GDIT workers' efforts to gain a voice in their workplace with CWA have been gaining momentum. With the help of CWA, GDIT workers have filed wage theft complaints against GDIT with the U.S. Department of Labor's Wage and Hour Division for violations at call centers in eight states – the largest wage theft complaint in history. Since January, more than 2,500 current and former GDIT call center workers have come forward to call on the Department of Labor (DOL) to investigate prevailing wage violations at the company. In August, GDIT was hit with two new National Labor Relations Board (NLRB) complaints for anti-union activities at call centers in London and Hattiesburg. 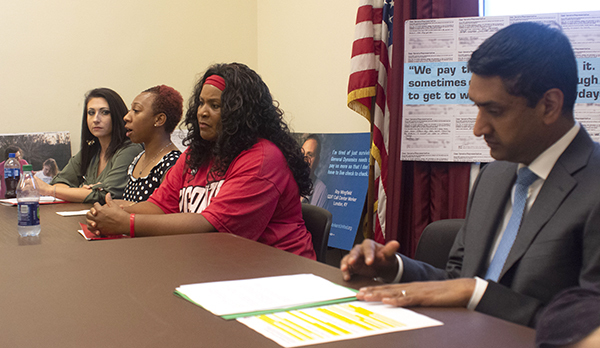 Workers from General Dynamics Information Technology (GDIT), the top federal contractor in the call center industry, joined a panel discussion on Capitol Hill to shine a spotlight on how labor law violations at federal contractors keep workers in poverty. In recent bargaining, AT&T has made no improvement to their offer on jobs or employment security. However, thanks to members' strong mobilization efforts, the AT&T Legacy T team was able to come to an agreement with the company on extending funding for the Alliance for Employee Growth and Development so there would be no interruption to Alliance training at this time. The CWA bargaining committees urge members to continue to mobilize by using political pressure, media, and community involvement to tell the company that they must bargain fair contracts for all of our members. 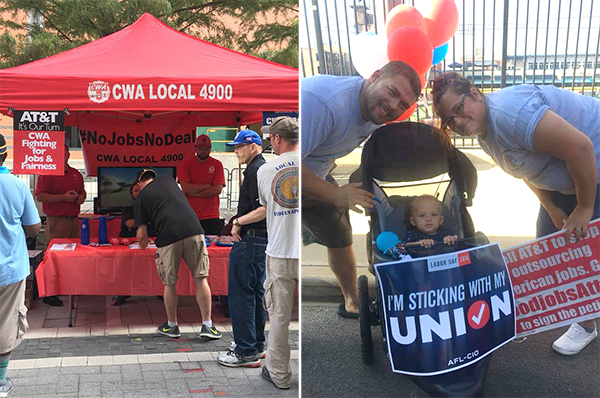 CWAers at AT&T Legacy T and AT&T Midwest, including members of Locals 4900 (left) and 4319 (right), are mobilizing for fair contracts. The union coalition representing 4,500 workers at the American Red Cross, including CWA members, reached a national tentative agreement on August 30. CWA represents Red Cross employees in Virginia, Pennsylvania, and New York. The union members who travelled from across the country to represent their locals at bargaining sessions and the solidarity demonstrated by the thousands of union members made the difference in winning this agreement, which contains wage increases and benefit improvements without any givebacks. 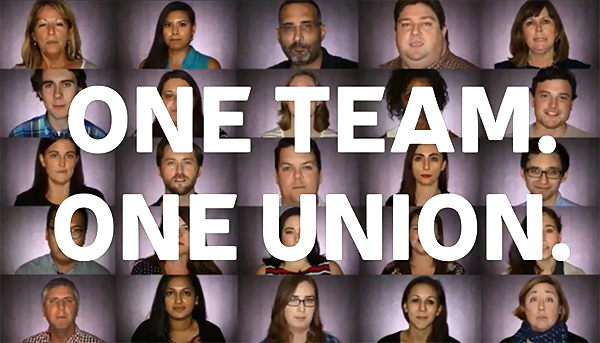 Employees at the Virginian-Pilot and the Daily Press, newspapers based in southeast Virginia, have asked parent company Tronc to voluntarily recognize their union. More than 75% of the newspapers' employees have signed authorization cards to be represented by the NewsGuild-CWA. Watch the Tidewater Media Guild's new video here. Employees at ReWire, a nonprofit news website reporting on reproductive and sexual health, rights, and justice, are seeking representation by the NewsGuild-CWA and have asked the company for voluntary recognition for their union. Last week, Good Jobs Nation released a new report revealing that despite Donald Trump's campaign promises, the offshoring of American jobs by U.S. corporations has increased to record levels on Trump's watch. The report found that since the election, American corporations have shipped more than 142,000 jobs overseas, and that federal contractors are now offshoring jobs three times faster than under President Obama – the highest rate in a decade. "It's frustrating to know that our taxpayer dollars are supporting their offshoring," said Brandon Kirnec, a CWA member who works at an AT&T call center in Youngstown, Ohio. "It's outrageous that instead of punishing AT&T, Trump's given the company more than $900 million in federal contracts." "Verizon recently announced that it was closing a call center in Arkansas. In the past six years, they've closed 19 call centers across the country – impacting 11,000 workers," said Latasha French, a CWA member and Verizon call center worker in Irving, Texas. "If Trump truly means what he's said – that he will be the greatest jobs president ever created, that he will be a champion for working people – he needs to start with the federal government." Members of CWA Local 4400 in Ohio's 1st Congressional District were out in full force in August knocking on 4,000 doors to talk to voters about the Republican corporate tax cut bill and to urge voters not to vote for Rep. Steve Chabot (R-Ohio) in November. CWA members are putting pressure on elected officials who sold out working families by voting for the Republican corporate tax cut bill that gave huge tax breaks to the super-rich and big corporations like AT&T. 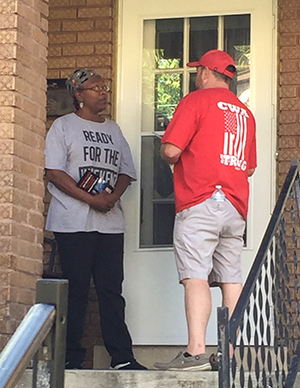 Members of CWA Local 4400 in Ohio's 1st Congressional District were out in full force in August knocking on 4,000 doors to talk to voters about the Republican corporate tax cut bill. Canvassers gathered pledges not to vote for the incumbent Rep. Steve Chabot (R-Ohio) who supported the bill. To get the tax cut bill passed, corporations like AT&T made big promises to create new jobs and raise wages. Instead, they've funneled those tax bill profits into massive stock buybacks that only enrich wealthy executives while their workers' wages remain stagnant. CWA members are making sure voters remember that Rep. Chabot voted for the enormous giveaway to Wall Street paid for by working families. In a Labor Day message, CWA President Chris Shelton highlighted the challenges facing our union in the face of the Janus Supreme Court decision, and how CWA members are fighting back. "While we honor our past, we are not bound by it," Shelton said. 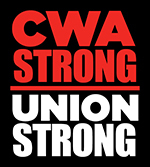 "CWA members have always looked toward the future and have made sure that our union is strong enough to withstand the tough times. The Janus decision and the aggressive campaign the one percent is waging to encourage members to drop out of the union is a test of that strength." Shelton said he is ready to bring forward "big, bold proposals" next summer at CWA's 77th Convention to increase our ability to organize and mobilize in light of the new challenges we face. "We have shown that we can overcome any challenge to grow our union. These times are calling on each of us to be the fearless labor movement heroes that we read about in history books. Those who came before us would expect us to fight like hell against this barrage of assaults on decent jobs and workers' rights, and those who come after us will be grateful that we did." 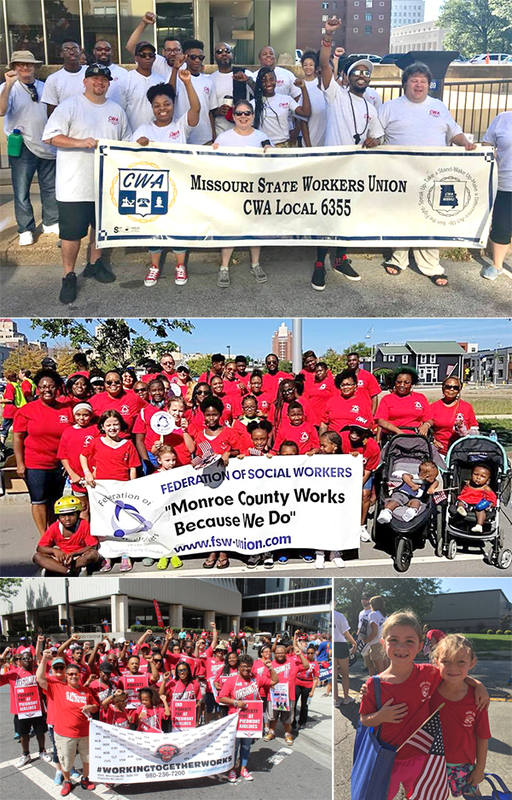 On Labor Day, CWA members joined community events to show that we are CWA STRONG. 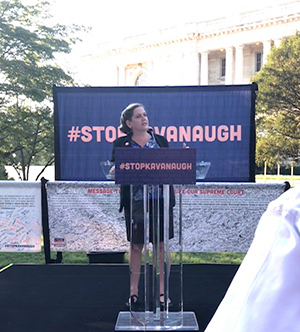 CWA Secretary-Treasurer Sara Steffens spoke at a rally on Capitol Hill about what's at stake for working people if Kavanaugh is confirmed to the U.S. Supreme Court. On Wednesday, CWAers joined allies for a rally at the Capitol to defeat Judge Brett Kavanaugh's nomination to the Supreme Court. CWA Secretary-Treasurer Sara Steffens spoke about what's at stake for working people if Kavanaugh is confirmed. Kavanaugh has a long record of routinely ruling against workers and their families and regularly siding with employers against employees seeking justice in the workplace – including CWA members. Kavanaugh's track record also shows hostility to government protections for workers, consumers, women, and fundamental civil rights. Call your Senators now to urge them to stop Kavanaugh! 1-888-894-6720. Click here to read the letters to ALEC corporate funders urging them to cut ties and stop funding the harmful, anti-worker organization.